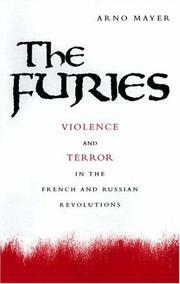 An analysis of the “furies” (both left and right) of the French and Russian Revolutions that gets lost in a time warp. Princeton historian Mayer (The Persistence of the Old Regime, 1981) sets out to show that there is no revolution without violence, terror, and war; that there can be no revolution without counterrevolution; and that revolutions, bad as they may be, are no worse than the unjust social orders that invariably precede them. The last point is Mayer’s most novel idea, but he never really proves it (and to the extent that he tries, he gets himself into hot water—arguing, for example, that the concentration camps of the Soviet Union were a reflection of “the dead hand of Russia's past”). He also develops another interesting idea, claiming that religious conflict was an important revolutionary force in both events; the Protestants were ranged against the Catholics in France, while the Jews in Russia were opposed by the White forces (who made good use of anti-Semitism in compensating for an unappealing political ideology). But when Mayer argues that “in the long run revolutionary situations benefit oppressed . . . religious minorities,” one wonders how he differentiates the subsequent travails of Jews in the Soviet Union. Similarly, his argument that Lenin did not encourage excesses and did not “instrumentalize” anticlericalism until 1918 runs up against the evidence of recently disclosed documents in which Lenin orders subordinates to shoot priests publicly. Mayer then argues that, in the short run, collectivization failed to remedy the chronic ills of agricultural production—which implies the truly novel conclusion that it did so in the long run. Finally, Mayer gives a reprise of the notion that Stalin might have permitted democracy in Eastern Europe if it hadn't been for the “perception” that somehow “took hold” that he intended to treat them like vassal states. Mayer claims to “brush history against the grain”—in fact, he succeeds mostly in brushing against the facts.